This one still intrigues me almost 7 years later. I still haven't seen a better one. This is a video of a crop circle being formed right before your eyes. Allegedly taken in 1996, there are some discussions of it here and here. Click to see it "stabilized"
Here's a shot by FOXNews published on Yahoo on Sunday Feb 2, 2003. It appears the footage was taken just before the shuttle started breaking up, since it is clearly all in one piece. Interestingly, it doesn't quite look like the space shuttle, it looks more like a, well, you know. More interesting is this: what's that blinking light following it? Click the thumbnail to watch the video. But this is my favorite. 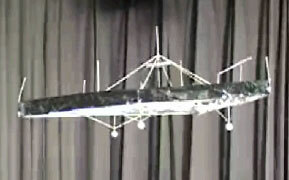 A coupla science students at this high school in Dearborn, Michigan made an anti-gravity "beamship". This is a must see, as well as the news and press about it.